I saw the strangest headline on Reuters’ Twitter this morning: “U.S. Coast Guard missions in doubt as aging ships wear out”. I thought it had to be wrong, the U.S. is famous for spending more on the military than any other ten nations combined. But I clicked the link and there it is, the Coast Guard is having trouble maintaining its fleet. Take a look at this table, a screenshot from this Wikipedia page. It shows the 15 countries that spend the most on their military. As you can see, the U.S. is way out in front, spending about five times as much as the number two country, China. Because I’m so helpful, I added up the other 14 numbers there and got 719.9. Out of the top 15 countries, nearly half of it is the United States alone. 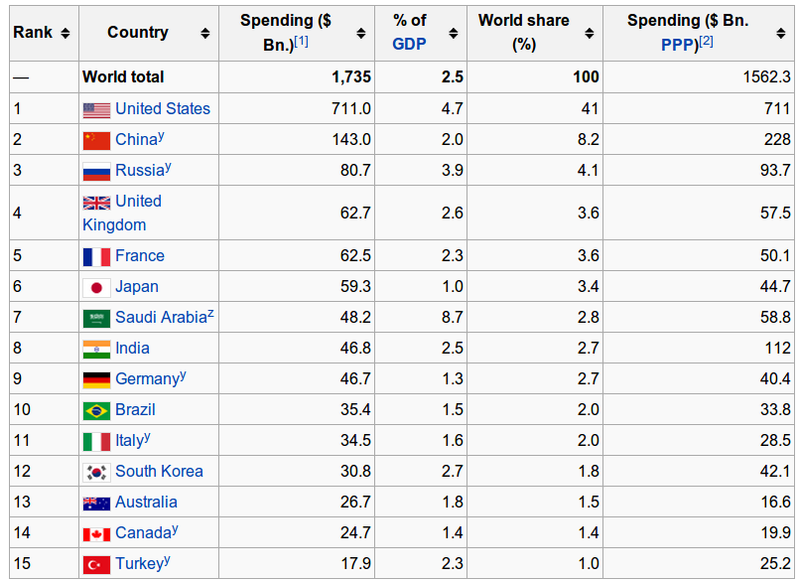 That table also tells us that the U.S. alone accounts for 41% of the total military spending in the world. And we can’t keep our Coast Guard afloat well enough to perform the missions expected of it. Mitt Romney’s taken a lot of flak lately for saying he’d cut public funding to PBS, which is about 0.012% of the budget and provides a genuinely useful service to everyone. Meanwhile we have this ridiculously huge military budget that still can’t get the job done. If you really want to cut out wasteful spending, Mittens, I think you’re looking in the wrong direction. Posted on October 8, 2012, in Daily Post and tagged Coast Guard, doing less with more, I don't know why I love calling Romney "Mittens" so much, postaday2012, wtf. Bookmark the permalink. Leave a comment.